For our meeting Monday Feb 4th 2019 we welcome Brigadier General Milford Beagle Jr the 51st Commanding General for the U.S. Army Training Center, Fort Jackson. Brigadier General Milford Beagle Jr., assumed duties as the 51st Commanding General for the U.S. Army Training Center, U.S. Army Training and Doctrine Command, on 22 June 2018, after serving as Deputy Commanding General for Support, 10th Mountain Division (Light), Fort Drum, New York. BG Beagle is a native of Enoree, South Carolina, and commissioned into the Infantry after graduating from South Carolina State University in 1990 as a distinguished military graduate. Brigadier General Beagle has led and commanded troops at every echelon from platoon to brigade. He has soldiered with five regiments, the 3rd U.S. Infantry Regiment (The Old Guard), the 6th Infantry, the 9th Infantry, 35th Infantry and the 41st Infantry Regiment, and with five divisions, the 2nd Infantry Division, the 2nd Armored Division, the 5th Infantry Division, the 10thMountain Division (Light), and the 25th Infantry Division. His key staff assignments include service as a planner and operations officer at battalion and brigade level, and as Chief Plans Branch, G3, Eighth Army, Republic of Korea. On the Joint and Army Staff, he served as the Joint Strategic Planner and later Executive Assistant to the Director, J-7, as well as the Division Chief, J-5, Joint Improvised Explosive Device Defeat Organization. 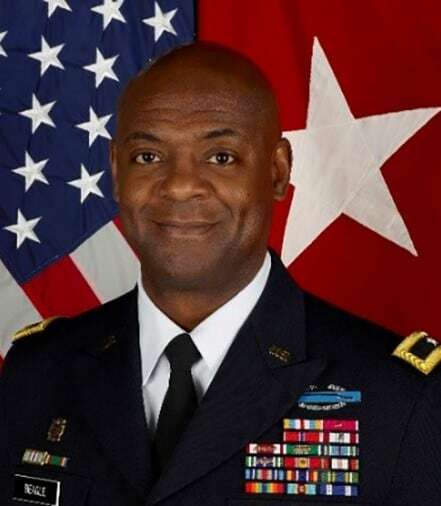 On the Army Staff, he served as the Executive Officer to the Vice Chief of Staff of the Army. BG Beagle’s combat and operational experience include Operation Iraqi Freedom, Iraq; Operation Inherent Resolve, Iraq; and Operation Enduring Freedom, Afghanistan. BG Beagle holds two master’s degrees from Kansas State University, Manhattan, Kansas, and the United States Army School of Advanced Military Studies from Fort Leavenworth, Kansas. He also earned the Expert Infantryman Badge, Combat Infantryman Badge, Parachutist Badge, Air Assault Badge, Ranger Tab, Pathfinder Badge and the Army Joint Staff Identification Badge. Brigadier General Beagle is married and has two children, one an Army Lieutenant and the other a university student.